Good looking neutral solids make getting dressed a snap. When I want to make the pieces feel more casual, I change the accessories. 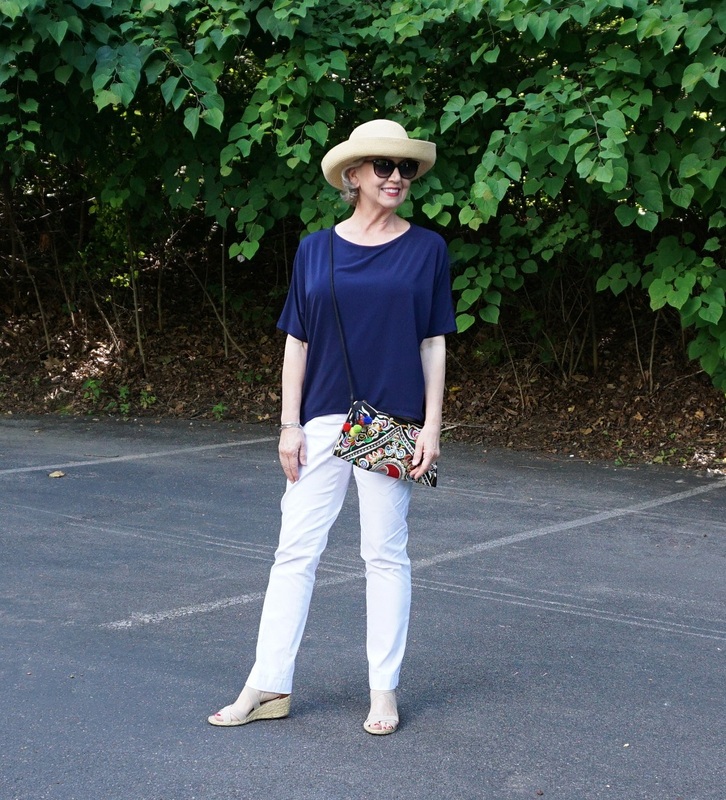 A colorful handbag in a festive pattern and a cute straw hat have long been my favorite summer accessories. 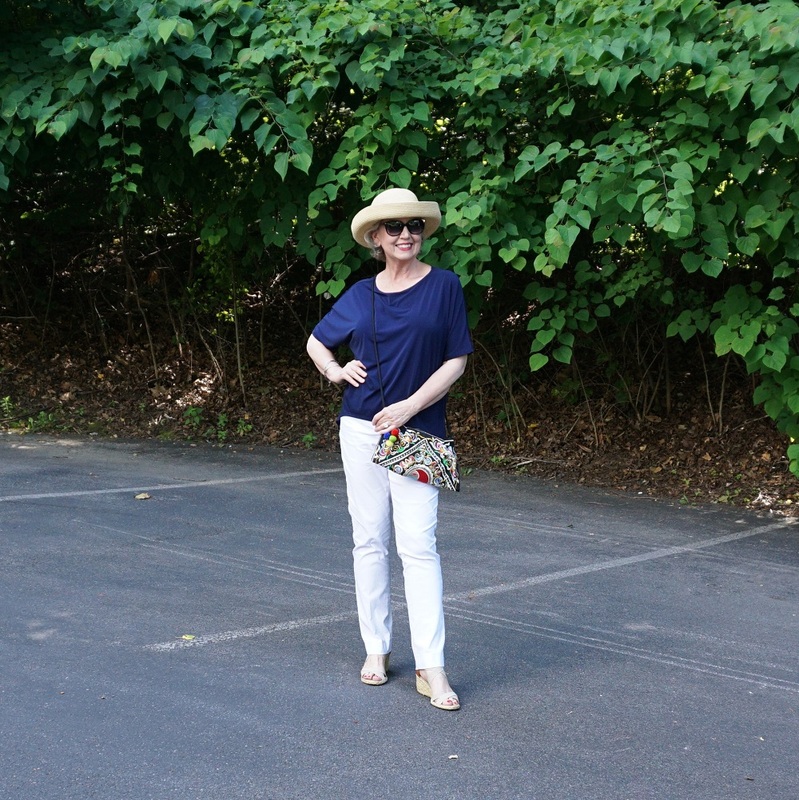 When the heat and humidity become too much for me, I reach for unstructured loose fitting tops and pants made from a lightweight fabric with no zipper or pockets. Even if my hair is limp from perspiration, you can’t tell because the hat saves the day. The fun colorfully embroidered handbag is from my online shop here. 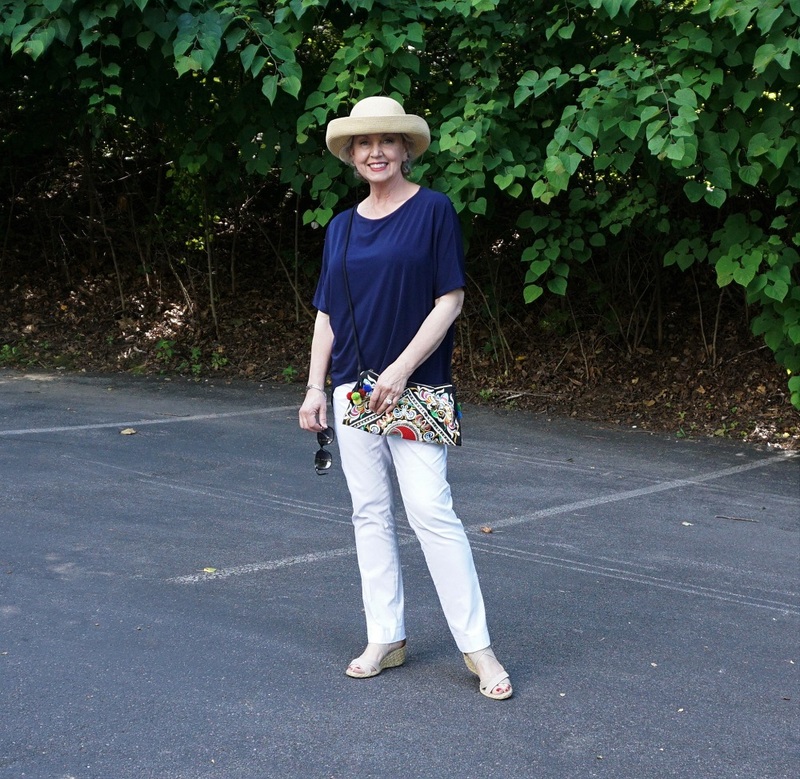 The Betmar straw roll-up hat is from Belk here. 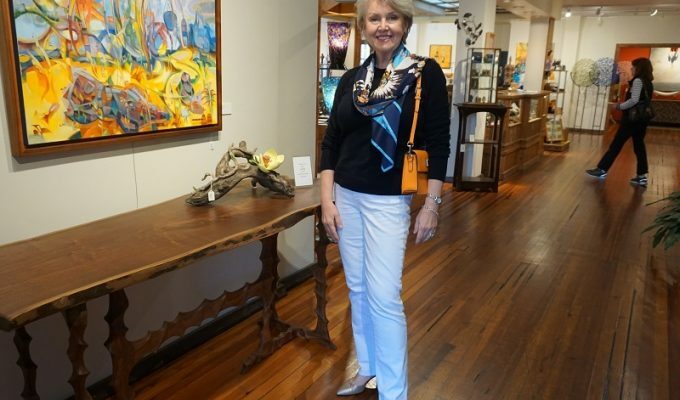 The espadrille shoes are from a past year by Ralph Lauren. My friends at My Fair Lady supplied the Lior Paris “Lize” straight leg pants and the top. The pants are here. The Clara Sunwoo short navy top is here. When you shop at My Fair Lady this month, use the coupon code Summer18 to get 15% off your total purchase. 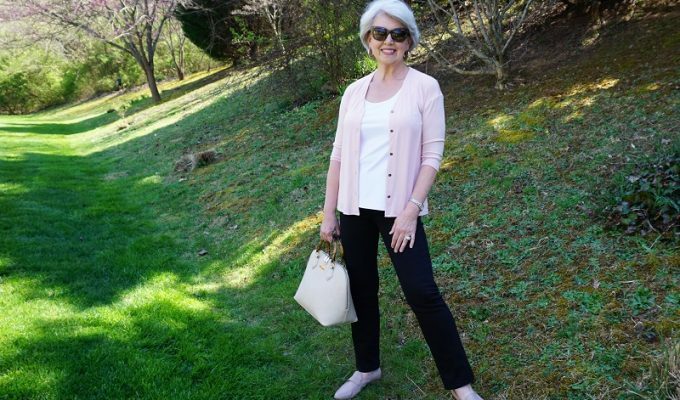 Without external investment, I have built this site to honor and serve women of all ages and have stocked the shopping site with classic basics and accessories which you can wear in a variety of ways. I am committed to helping you stretch your wardrobe possibilities while looking your best. I continue to study trends and style advice from image experts so that the tips I share with you are never just me sharing my opinion. 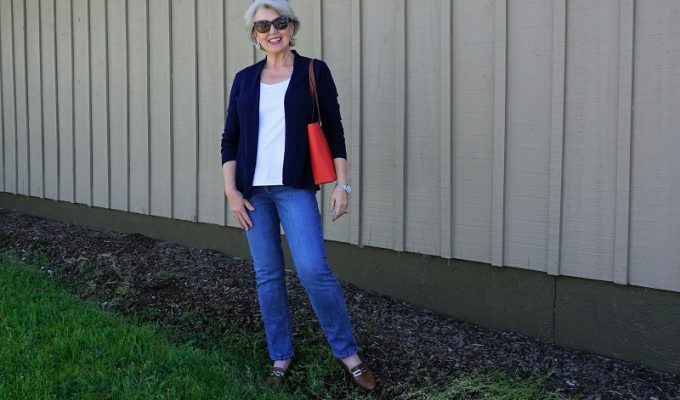 SusanAfter60.com is a site where women can share their thoughts, ask questions, gather style tips, local travel inspiration, and learn about nutrition. This bag is almost just like the one that Lesley wore for our photo shoot—the one she asked you if it was okay to link to about!!! Heck, maybe it is the same bag…I haven’t edited the photos yet to take a closer look!! But it’s such a perfect way to add a punch of color to any outfit~!! I ordered the blue print tunic from Clara Sunwoo that you highlighted several posts ago. Arrived within just a few days. I absolutely LOVE it!! Fabric is heavenly, print is wonderful, fit is great and lengthy is just perfect. I will be ordering more of this style. The June discount was an added bonus. Thank you so much for the info. Can’t go wrong with this beautiful tunic. Thank you for letting me know you are pleased with your purchase. Enjoy it often! Susan, I love your blog and have learned a lot from you. One question: You switch bags so often and I understand why, but how do you transfer essentials from bag to bag, and what do you consider essential? I love smaller cross-body bags but they never seem to hold all I want them to. A few years ago, I did a video to explain how I easily change my bags often. The video is here. I always enjoy your casual outfits, since that is what I wear most of my days. You always manage to take the outfit up a notch by adding accessories and a good looking shoe. Thank you for taking the time to maintain your blog. It must be a lot of work and I appreciate it! Susan, I’ve successfully adopted so many of your outfit ideas. But your youtube video about how to pack for a week in a carry-on bag is life-changing—THANK YOU! I travel fairly often both for work and pleasure/family trips and have tried every packing method known to woman…without success, until I followed your how-to video. I still can’t believe it–everything for 6 days is packed into my 20″ carry-on in preparation for tomorrow’s flight. I did not skimp on items, nor did I even have to open up the gusset–it’s like a miracle! And I can already see that my clothing will be less wrinkled due to how it’s folded. (This was a video from a couple of years ago when you packed for a photo shoot in LA, but you recently posted a link to it in a more recent posting). Thank you for all the knowledge you share with us so freely. I’m thankful that what I share has been helpful. I totally agree as well. I can’t thank you enough! J Jill is currently running 30% off all sale merchandise! You always look fabulous. Thank you for your help! It’s life changing. I love J Jill! I’m wearing my favorite jeans by them today. Thanks for the tip! Please post the link to the packing video??? I look forward to your posts. You are a true inspiration. Keep up the great work with the knowledge that you are an important model for many. I love your style, it looks like something I would choose for myself if I was out and about and we about the same size and age. However I am a stay at home grandmother (meaning I keep my grandson 5 days a week and I love it. But there in lies the problem. Do you have some advice on how to dress when you are playing on the floor all day with a 13 month old? I would appreciate any advice you can offer. The style 704 pants from my site are so comfortable you could sleep in them. They look great with any style top from a jean jacket to a cute knit or a dressy blouse. Any footwear from slip-on sneakers to sandals or pumps will work with them.